© 2003 Diana Coate Wolverton. All rights reserved. another of my favorite hymn nuggets in “Praise, My Soul, the King of Heaven”" is front and center in “Ransomed.” Just four words extracted from this hymn tell an entire story: Ransomed, healed, restored, forgiven. Alleluia! 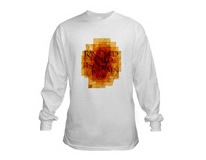 Hymnscript clothing and accessories are produced and sold by CafePress. If for any reason you need to return or exchange an item, just contact CafePress's Customer Service department. CafePress holds a non-exclusive license to produce decorative art items featuring the Hymnscript collection from Diana Wolverton Studio. ransomed, healed, restored, forgiven, evermore his praises sing. Alleluia! Alleluia! Praise the everlasting King. Alleluia! Alleluia! Glorious in his faithfulness. Alleluia! Alleluia! Widely yet God’s mercy flows. but while mortals rise and perish, God endures unchanging on. Alleluia! Alleluia! Praise the High Eternal One. Alleluia! Alleluia! Praise with us the God of grace. Copyright © 2003–2009 by Diana Coate Wolverton. All rights reserved. Hymnscript and the Hymnscript logo are trademarks of Diana Coate Wolverton.